A Customer Service Specialist communicates vital information about the company’s product and services to the customers. The job responsibilities that are normally shouldered by these specialists include responding to customer’s inquiries, guiding customers in the purchasing processes, making product or service recommendations, resolving complaints and registering technical issues of customers. It is the duty of the customer service specialist to ensure that they maintain a high level of customer satisfaction apart from executing their assigned job tasks. As this job position requires regular interaction, candidates are expected to possess excellent resolving dispute skills and have a thorough knowledge of Microsoft Office Suite and Internet Information Services. Even though this job post does not require any formal education, hiring employer prefers to hand over this crucial task to the Customer Service Specialist Resume that depicts a degree in Marketing, communication, sales, service communication or any similar field. Summary : Over 15 years experience as a Customer Service Specialist is actively seeking a position where I can optimize my problem-solving and organizational skills to contribute to increased customer satisfaction. Skills : Running Register Systems, Negotiation, Training, Formulating Plans, Presenting Ideas, Understanding of Vendor Flow/price Points, Pricing, Sensor Tagging, Floor Sets, Seasonal Sets, Assigned Endcaps, Planograms, And Visual Directives. Responsible for the effective operation and continued growth of the center with direction from the Divisional Director of operations. This position ensures that each team member is trained in all procedures, policies, products, and programs. Exceptional customer service, attention to detail. Increasing overall performance, productivity, and profitability and, is responsible for building sustainable customer relationships with the successful delivery of customer service and monitoring/measuring customer satisfaction. Promoting employee engagement, teamwork and job satisfaction through continued coaching and development. Relationship building /customer experience: build strong relationships with current and prospective customers, in person, in the market, and over the phone. Monitoring and measuring customer satisfaction, take the lead on case management for delinquent accounts. Product promoter and sales champion: understand, recommend, and sell financial products and services to customers. Cross-selling core/ancillary products while center staff completes customer transaction before the customer leaves the center. Responsible for the on-going marketing strategy and physical marketing along with four walls marketing- inactive calls, cross-selling, professional image. Developing a marketing plan to track marketing success, organizes local store marketing (LSM) and community events. 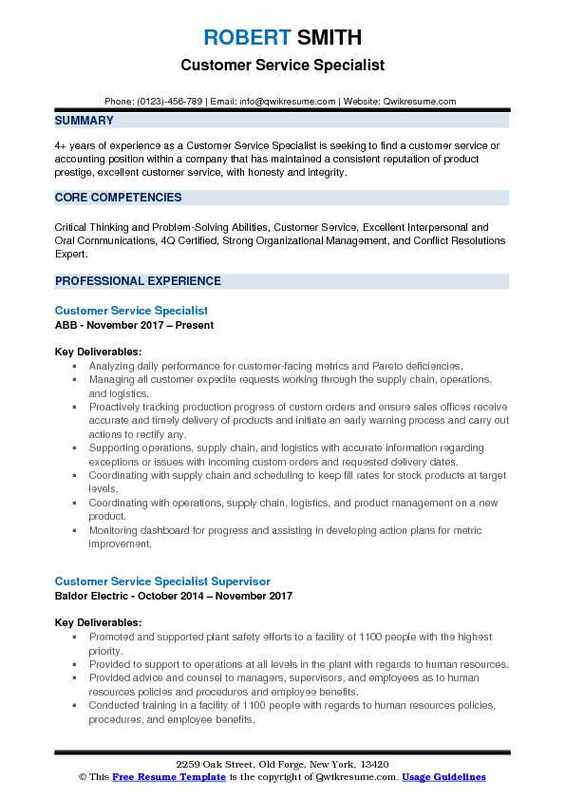 Objective : 4+ years of experience as a Customer Service Specialist is seeking to find a customer service or accounting position within a company that has maintained a consistent reputation of product prestige, excellent customer service, with honesty and integrity. Skills : Critical Thinking and Problem-Solving Abilities, Customer Service, Excellent Interpersonal and Oral Communications, 4Q Certified, Strong Organizational Management, and Conflict Resolutions Expert. Analyzing daily performance for customer-facing metrics and Pareto deficiencies. Managing all customer expedite requests working through the supply chain, operations, and logistics. Proactively tracking production progress of custom orders and ensure sales offices receive accurate and timely delivery of products and initiate an early warning process and carry out actions to rectify any. Supporting operations, supply chain, and logistics with accurate information regarding exceptions or issues with incoming custom orders and requested delivery dates. Coordinating with supply chain and scheduling to keep fill rates for stock products at target levels. Coordinating with operations, supply chain, logistics, and product management on a new product. Monitoring dashboard for progress and assisting in developing action plans for metric improvement. Collaborating with the supply chain for vendors needing to improve delivery performance maps. Appropriate processes that impact customer experience and develop improvements that translate into improved customer-facing metrics. Collaborating with existing subject matter experts on current and upcoming processes/applications, in order to contribute to the design and maintenance of processes within factories. Evaluating local business requests and work with the business team to determine the validity and necessity of requests. 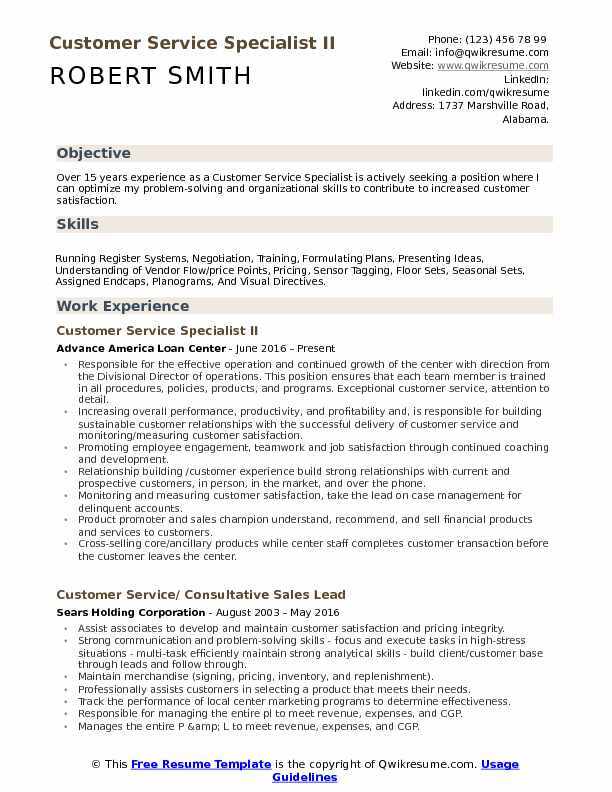 Summary : 8 years of experience as a Customer Service Specialist is seeking to obtain a great position within a company, where I can enjoy working for, while at the same time utilize my skills and knowledge that I have gained throughout the years for the benefit of the company. 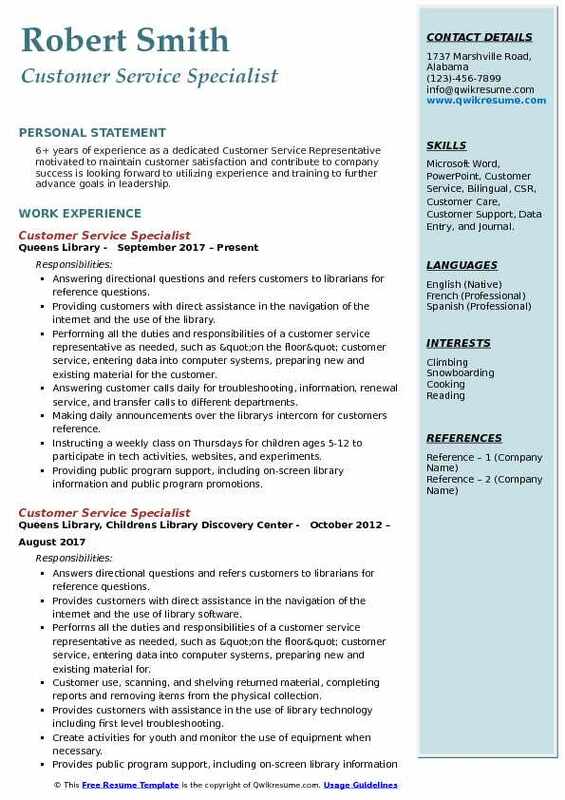 Skills : Bilingual: Spanish/English, CSR, Customer Care, Customer Service, Call Center, MS Windows, Word, Excel, PowerPoint, Outlook, and Internet Research. Make sure all customers entering and exiting the store were acknowledged. Assign daily tasks to cashiers to complete throughout their shifts. Responsible for success in front-end metrics: scorecards, AOS, NSPP, PLCC, and OSAT. Give override numbers in needed situations: price overrides, return approval, firearm sales, post voids, and loans. Ensure the safe counted out at ten thousand dollars before opening for business. Stocked all registers with cash drawers so customers could be taken care of quickly and efficiently. Responsible for making Pepsi orders to ensure all drink coolers throughout the store were fully stocked at all times and that the store had a good amount of back stock on hand for replenishment. Used sim web application to receive vendor drop shipments and to ensure inventory counts were accurate. Responsible for managing cash operations, such as balancing drawers at the end of the night, and entering them in the system to observe any overages/shortages. Ensure all daily paperwork as printed out, completed correctly, signed, and filed away correctly according to company standards. Ensure the safe counted out at ten thousand dollars at the end of each night before the closing of business. 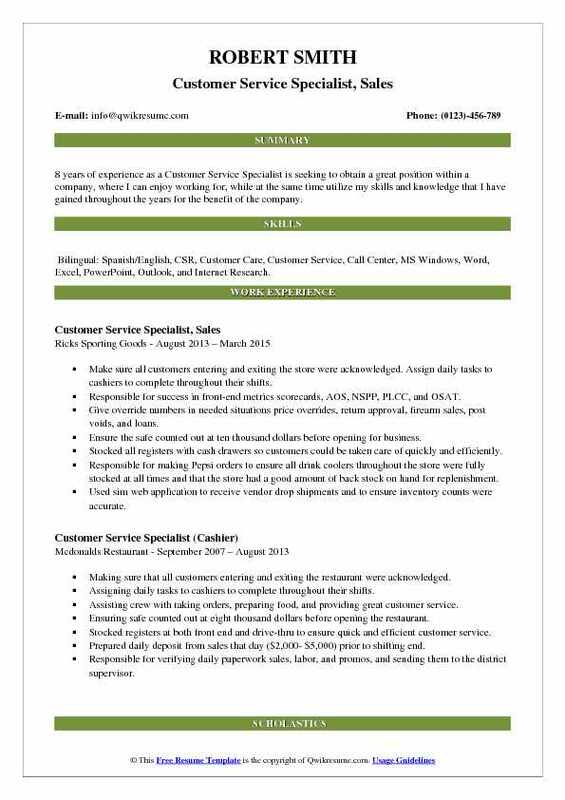 Summary : Customer Service Specialist with over 14 years of experience who is dedicated and self-motivated to succeed. Experience includes strong capabilities as well as background with system testing and analyzing. Follow through Detail Oriented Team Player Relationship building Communication skills. Skills : Microsoft Office skills, VLOOKUP/Pivot tables, SAP and EDI, Microstrategy, Customer Service, Bilingual, CSR, Customer Care, and Customer Support. Provided a high level of customer service by ensuring all orders were processed, released and shipped on time. Worked with supply planning and sales administration to understand stock issues, allocations and launch requirements to ensure orders were met within the shipping window not to effect on time. Established strong relationships with both internal and external partners to create a solid report ensuring the smooth flow of transactions and sales orders. Acted as a key user and project coordinator during the biggest integration in the history of the beauty industry, provided transitional testing support to ensure system capabilities remained in place prior to completing the transition of PG to the city. Provided end-user training to fellow coworkers by using live demonstrations and power point presentations for a better understanding on new system and processes. Assisted as a regional delivery manager planning responsible for creating deliveries and shipments to process orders to the 3rd party distribution center. Executed no touch and order scorecards to report KPIs to upper management with the required information on order metrics. Coordinated EDI startups based on system capabilities and target dates. Acted as a liaison between the support resources and the prestige business. Provided resolution support and the root cause of EDI outages to include but not limited to, ASN failures, invoice errors, and purchase order rejections. Monitored system daily for order and invoice processing. Captured rejections promptly so that they were resolved in a timely manner with no interruption to the business. Assisted with various business testing scenarios along with new customer setups and transactional testing to ensure a smooth flow of orders and invoice processing with little to no interruption to the prestige business. 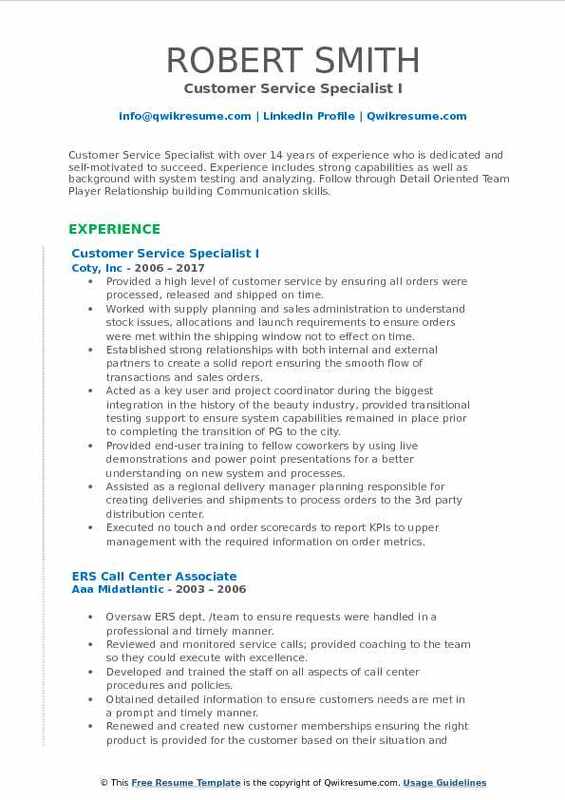 Headline : 6+ years of experience as a dedicated Customer Service Representative motivated to maintain customer satisfaction and contribute to company success is looking forward to utilizing experience and training to further advance goals in leadership. 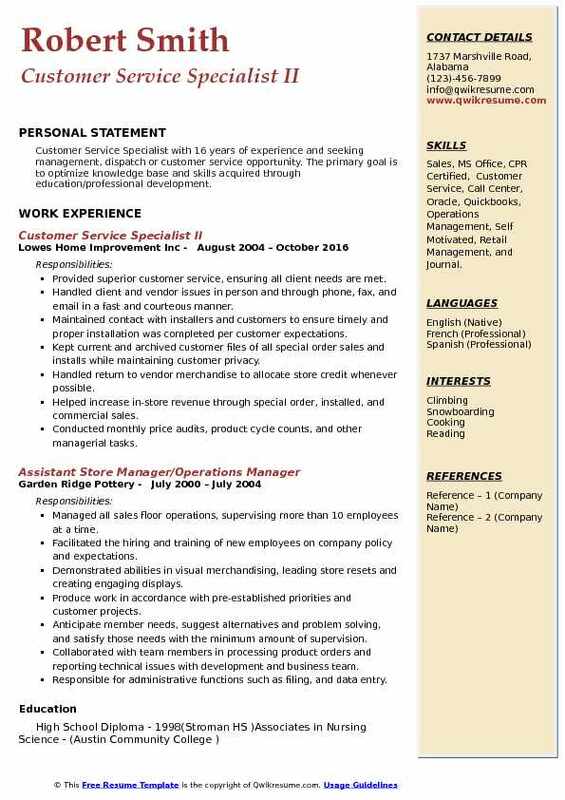 Skills : Microsoft Word, PowerPoint, Customer Service, Bilingual, CSR, Customer Care, Customer Support, Data Entry, and Journal. Answering directional questions and refers customers to librarians for reference questions. Providing customers with direct assistance in the navigation of the internet and the use of the library. Performing all the duties and responsibilities of a customer service representative as needed, such as "on the floor" customer service, entering data into computer systems, preparing new and existing material for the customer. Answering customer calls daily for troubleshooting, information, renewal service, and transfer calls to different departments. Making daily announcements over the library's intercom for customers reference. Instructing a weekly class on Thursdays for children ages 5-12 to participate in tech activities, websites, and experiments. Providing public program support, including on-screen library information and public program promotions. Monitoring programs, prepare reports and ensures appropriate setup is completed. Summary : 11 years of experience as a Customer Service Specialist is recognized for being an efficient problem solver being able to perform any job assigned. I'm ambitious and hardworking, thrive under pressure, very detail oriented making sure to meet and exceed goals in deadlines. I have a great time management skills and available to work any hours required. 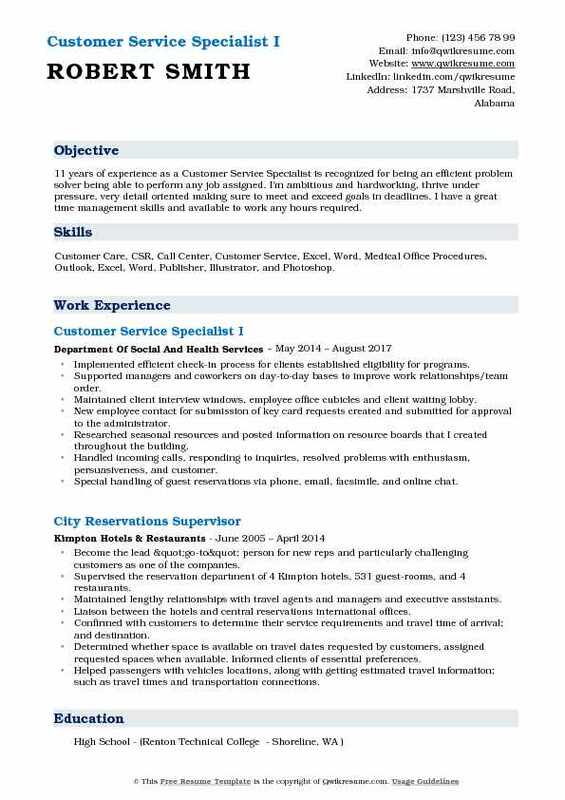 Skills : Customer Care, CSR, Call Center, Customer Service, Excel, Word, Medical Office Procedures, Outlook, Excel, Word, Publisher, Illustrator, and Photoshop. Implemented efficient check-in process for clients established eligibility for programs. Supported managers and coworkers on day-to-day bases to improve work relationships/team order. Maintained client interview windows, employee office cubicles and client waiting lobby. New employee contact for submission of key card requests created and submitted for approval to the administrator. Researched seasonal resources and posted information on resource boards that I created throughout the building. Handled incoming calls, responding to inquiries, resolved problems with enthusiasm, persuasiveness, and customer. Special handling of guest reservations via phone, email, facsimile, and online chat. Management of negotiated rate loads at each Kimpton property and their third party sells the sites. Active implantation of sell strategies to promote the brand through Kimpton services, amenities, and restaurants. Liaison between the hotels and central reservations international offices. Trainer of hotel systems including voice agent, Epitome, Yammer, SYNAGIS, and SABRE. Creator of hotel packages out for promotion on news and media sites locally. 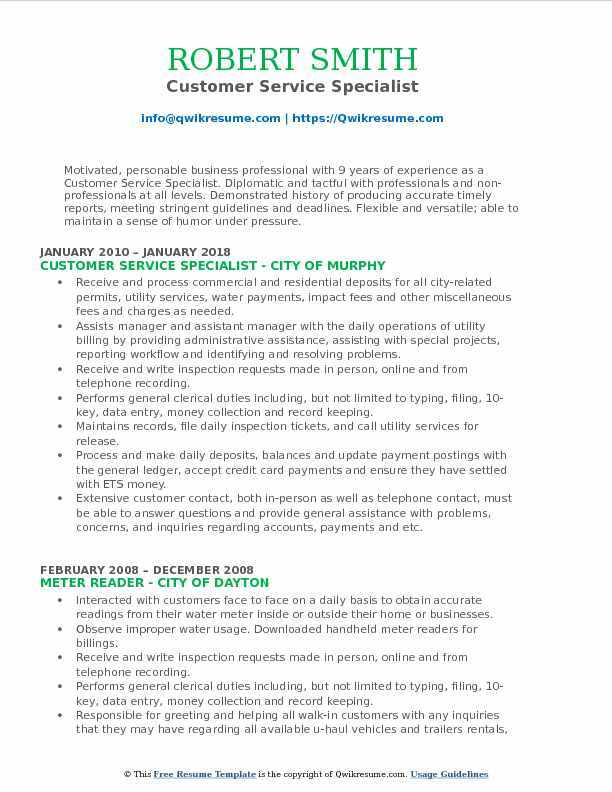 Summary : Motivated, personable business professional with 9 years of experience as a Customer Service Specialist. Diplomatic and tactful with professionals and non-professionals at all levels. Demonstrated history of producing accurate timely reports, meeting stringent guidelines and deadlines. Flexible and versatile; able to maintain a sense of humor under pressure. Skills : Project Management, Laserfiche, Accounting/Bookkeeping, Report Preparation, Customer Service, Front-Office Operations, General Office, Certified Permit Technician, Time & Attendance. Receive and process commercial and residential deposits for all city-related permits, utility services, water payments, impact fees and other miscellaneous fees and charges as needed. Assists manager and assistant manager with the daily operations of utility billing by providing administrative assistance, assisting with special projects, reporting workflow and identifying and resolving problems. Receive and write inspection requests made in person, online and from telephone recording. Performs general clerical duties including, but not limited to: typing, filing, 10-key, data entry, money collection and record keeping. Maintains records, file daily inspection tickets, and call utility services for release. Process and make daily deposits, balances and update payment postings with the general ledger, accept credit card payments and ensure they have settled with ETS money. Extensive customer contact, both in-person as well as telephone contact, must be able to answer questions and provide general assistance with problems, concerns, and inquiries regarding accounts, payments and etc. Maintain all customer accounts, update account information on computer and set up accounts. Prepare monthly reports/correspondence relating to alcohol, health, and building permits. Headline : Customer Service Professional with over 6 years of diverse experience. Delivering sustained exceptional clerical, administrative, document management and customer service skills; specializing in timekeeping, benefits and medical administration. Seeking to enhance professional experience by increasing functional role/responsibilities, to obtain a supervisory/managerial functional role. Skills : KRONOS, Medicaid, Medicare, Microsoft Project, CRM, Peoplesoft, Siebel 8.1-CRM, Microsoft Visio, CITYTIME, Oracle Enterprise Content Management Suite -UCM/I/PM, Adobe CS6, Epic, ICD-9, ICD-10, HIPPA, EHR, and EMR. Generating MABSTOA/MTA BUS, LIRR & MNCRR service requests for pension estimates, service summary, buyback services, eligibility, pension contributions/loans, arrears and affidavit verifications. Handling complex queries and service requests in benefits, payroll, accounts payable, human resources & procurement. Generating/escalating procurement service requests relating to contract/purchase orders, inventory, my marketplace, requisitions/receipts, strategic sourcing and vendor inquiries. Educating vendors/suppliers/bidders with step-by-step navigation to process bids for the request for proposals (RFP). Resolve or escalate vendor/supplier inquiries relating to invoice/payment processing, vendor maintenance, purchase order (PO) inquires and status updates. Analyze and resolve payroll inquiries regarding compensation, garnishments, deduction/rates, direct deposit, payroll forms, vacation, w2, tax withholding, KRONOS and time/labor issues. Educating employees/vendors with detailed instruction for paper/electronic e-access forms for benefits, payroll, IT, HRIS, employment, HR, and Finance. Research life insurance benefit eligibility for active/retired/ deceased employees and process claims forms/affidavits for spouse/beneficiaries of deceased employees. 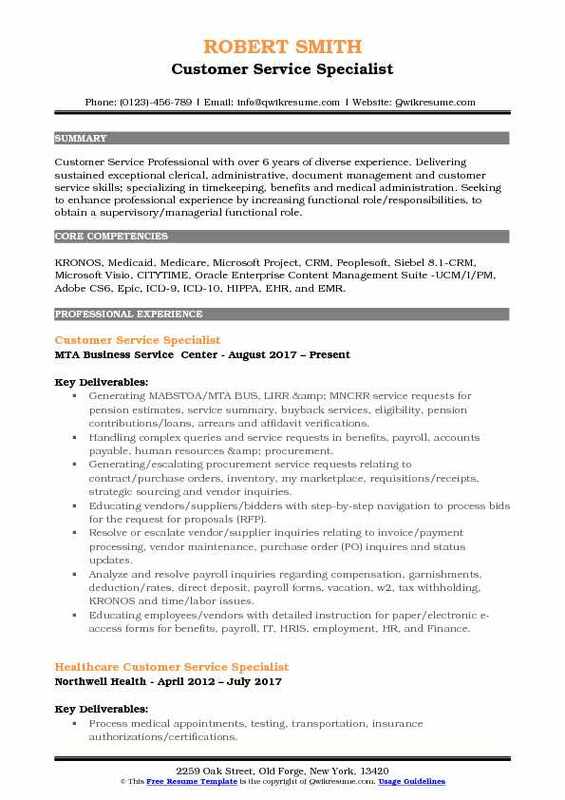 Summary : Customer Service Specialist with 16 years of experience and seeking management, dispatch or customer service opportunity. The primary goal is to optimize knowledge base and skills acquired through education/professional development. Skills : Sales, MS Office, CPR Certified, Customer Service, Call Center, Oracle, Quickbooks, Operations Management, Self Motivated, Retail Management, and Journal. Provided superior customer service, ensuring all client needs are met. Handled client and vendor issues in person and through phone, fax, and email in a fast and courteous manner. Maintained contact with installers and customers to ensure timely and proper installation was completed per customer expectations. Kept current and archived customer files of all special order sales and installs while maintaining customer privacy. Handled return to vendor merchandise to allocate store credit whenever possible. Helped increase in-store revenue through special order, installed, and commercial sales. Conducted monthly price audits, product cycle counts, and other managerial tasks. Trained new employees on company policies, products, sales strategies, and the use of in-store technology for sales purposes. Maintained a clean and safe sales floor in a very fast-paced, customer-focused environment. Used heavy equipment such as forklift, scissor lift, and reach truck to transport merchandise in the store. 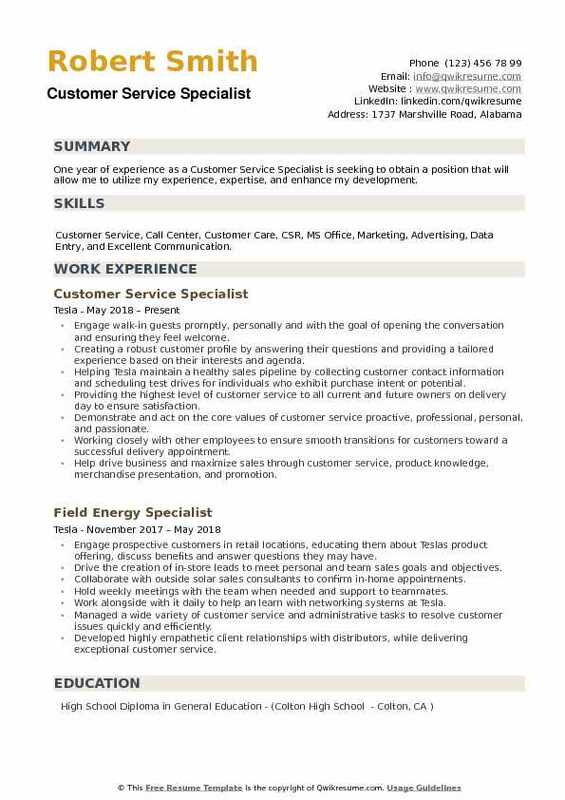 Objective : One year of experience as a Customer Service Specialist is seeking to obtain a position that will allow me to utilize my experience, expertise, and enhance my development. Skills : Customer Service, Call Center, Customer Care, CSR, MS Office, Marketing, Advertising, Data Entry, and Excellent Communication. Engage walk-in guests promptly, personally and with the goal of opening the conversation and ensuring they feel welcome. Creating a robust customer profile by answering their questions and providing a tailored experience based on their interests and agenda. Helping Tesla maintain a healthy sales pipeline by collecting customer contact information and scheduling test drives for individuals who exhibit purchase intent or potential. Providing the highest level of customer service to all current and future owners on delivery day to ensure satisfaction. Demonstrate and act on the core values of customer service: proactive, professional, personal, and passionate. Working closely with other employees to ensure smooth transitions for customers toward a successful delivery appointment. Help drive business and maximize sales through customer service, product knowledge, merchandise presentation, and promotion.